Ozeki Cluster is a software	that can move a service to another computer in case of hardware failure. It can also synchronize files and directories when the two servers are healthy. This is a great tool you can use to build a reliable fault tolerant system from multiple servers. To operate, Ozeki Cluster has to be installed on both the live and the backup server. Every 10 seconds the two servers ping each other to find out if the other server is on-line. If one of the computers find out the other one is not accessible, it alerts the system administrators using e-mail, sms or voice calls. If the primary server fails, the software starts the configured service(s) on the backup node. Hardware can fail. To provide a reliable service, you need a solution, that detects failure and acts automatically. OZEKI Cluster automatically moves any service to another computer in case of a hardware failure, and keeps the IP address associated with the service on-line. Ozeki Cluster can also keep your files synchronized. Learn how to setup such a solution. 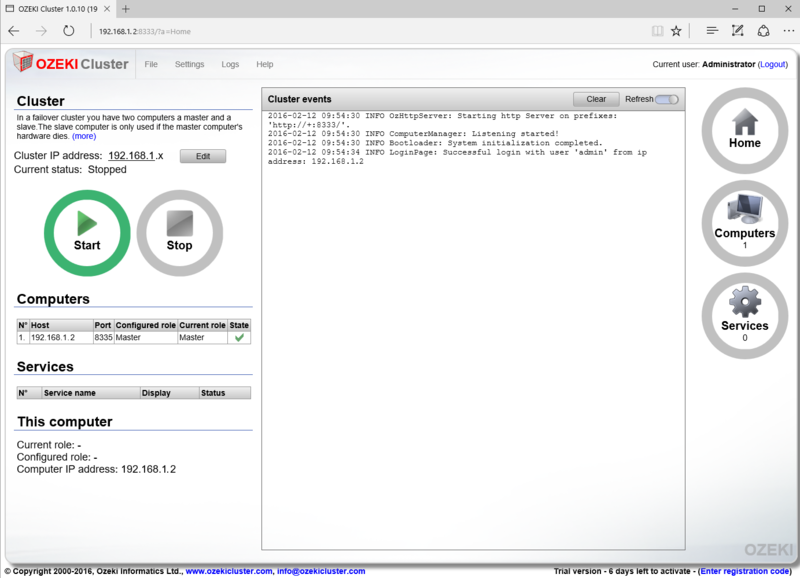 Installing Ozeki Cluster is simple and straightforward, you simply download the installation package and run it, then click next on most screens. During the installation you will need to specify the target directory and you will need to provide a password you can use for confiuration. This is an example configuration, that demonstrates how to setup a failover cluster. This example configuration works on two servers (one primary and one backup), and it moves the Ozeki NG SMS Gateway service to the backup node if the primary server hardware fails. This data sheet lists all the hardware and software requirements of Ozeki Cluster and it shows the most up to date information about the software. In general Ozeki Cluster does not have any special hardware or software needs, it will work straight out of the box with most Windows computers. 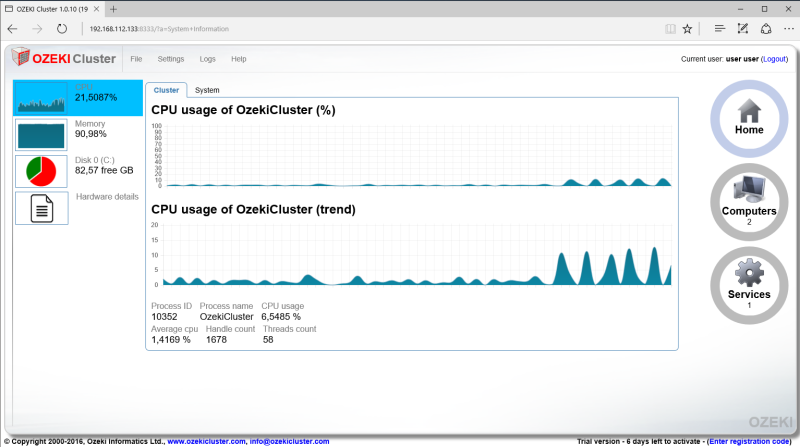 In this section, you will find screenshots and descriptions of the most important features of OZEKI Cluster. For example you will see how the screen will look when you setup the cluster IP and what the forms used to add a computers services to the cluster look like. When you purchase an Ozeki Cluster license, you receive a serial number. The software can be activated with this serial number on your primary server and on the backup server(s). 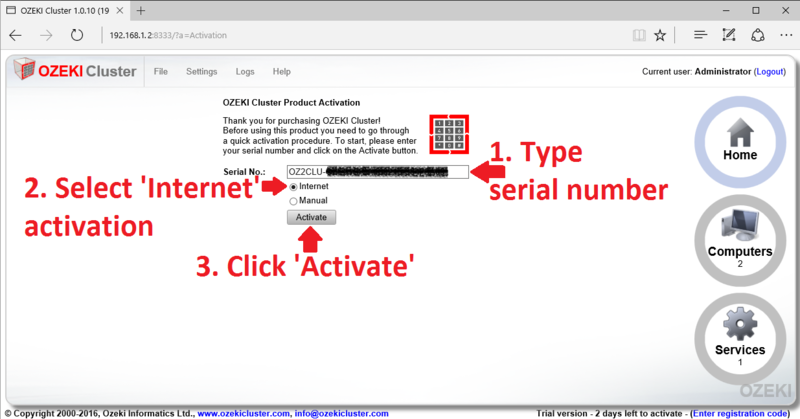 This guide gives you information on how to activate your Ozeki Cluster installation using the purchased serial number.